With all the news channels advising of heavy bank holiday traffic the PRATS set off at 8:00am. We are once again Pharpless, so today we are joined by Bogsnorkle. We were expecting to join the first traffic jam at Silverstone where the MotoGP was taking place, not a thing. In fact we never encountered any traffic at all and arrived in Devizes considerably early at 10:15am. We parked outside the Crown and snaffled the first sarnie of the day. Then we spotted about 200 yards away the Wadworth’s Brewery visitor centre, so, purely in the interests of research we thought we’d take a look around. To our surprise the bar was open serving sample glasses 1/3pints. It was 10:25am when we sampled our first ale of the day, the delightful Horizon a lovely fresh light ale 4% and as you would imagine, it was in pristine condition. We then had a sample of a Rugby World Cup special Dirty Rucker, nice dark ale with a noticeable peppery finish, very tasty at 3.9%. I suspect we’ll see a plethora of rugby themed ales over the coming months. It was now time to go to the first pub, The Crown, in Devizes owned by Wadworth’s. 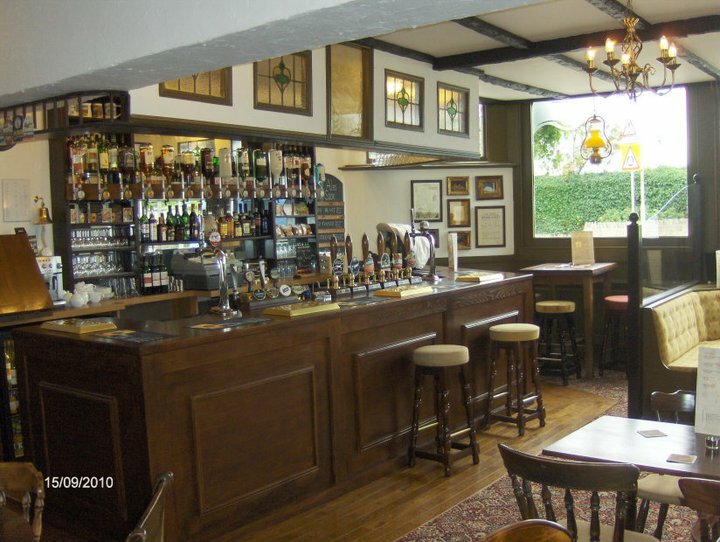 A smart pub that stretches a long way back. 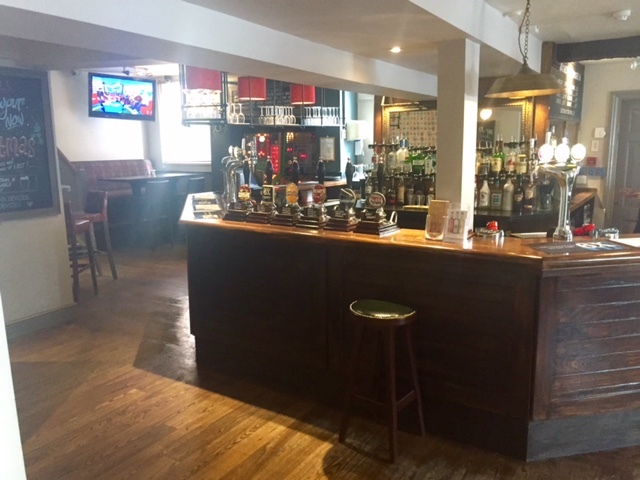 The bar has a nice row of 6 hand pumps; the ales on offer were 6X naturally, Henry’s IPA, Horizon, Bishops Tipple, Swordfish and Dirty Rucker. As the Horizon was so refreshing at the brewery we decided to go for that again, but this time we had a pint and very good it was too. Citra and I raised the strength and followed up with the 5% Bishops Tipple. Both ales were in superb condition. Although we didn’t try any of the food, the menu looked very good, nice place to take the better half. It was time to continue our journey as we wanted to be in The Griffin, Milk St’s brewery tap by 12:30pm. They had kindly opened up early for us. Using satnav we got reasonably close to the pub, just the wrong side of a closed off road, but only a short walk. Clearly a pub for beer drinkers, the only lager pump tucked almost out of site in the corner of the bar. 6 hand pumps, 5 from Milk St and one from Wold Top. The house ales were Funky Monkey, Amarillo, Usual, Beer and Zigzag their stout. Citra, Bogsnorkle and I went for Funky Monkey 4%, whilst Parker sampled the Usual 4.4%, a slight haze on both ales but they both tasted fine with a loose head precariously clinging to the glass. By now Marshall, Petit Chemise and Wort had joined us. They went for Usual and Amarillo 4.6%; the latter looked lovely and pale and was just up our street so we moved onto that next. Once again the slightest of haze on the beer, good tasty ale. This is one of their seasonal ales from March and April; it must be popular if they’re still knocking it out in August. I finished with a move to Wold Top’s Wold Gold 4.8%, whilst the others stayed with the local ales. A lovely prize winning ale, yet once again a slight haze, tasted fine. There were a few craft ales on tap, Brewdog‘s Punk IPA, Meantime’s London Pale ale, Milk Street’s Elderfizz, http://www.milkstreetbrewery.co.uk/2012/06/elder-fizz-5/ ,plus a cider or two. At the back of the pub we could hear some activity in the brew house, the usual clanging of barrels, I don’t think they were brewing, none of the normal aromas you’d expect on brew day. All in all a nice experience, it was approaching 2:00pm we needed to be heading our way to the Frome Town ground, the Blindmans Brewery Stadium. We meandered our way through Frome and eventually arrived. The name of the stadium had raised some optimism and we weren’t disappointed, in the bar they had Blindmans 1904. A chestnut ale at 3.9%, sort of ok. Looking on the Blindmans website for a bit more info and nothing there, as Frome Town were formed in 1904. It doesn’t take too much imagination to establish this is a special or regular ale re-badged, although no ales appear on the brewery website that fits this ale. This is our third away trip so far this season and all three have had a club special ale. Non-league footy is a good place to be for ale drinkers, marvellous. The game, well the Poppies won their first away game of this season. Not our best performance, probably our worst. When we lost at Leamington, the general opinion was that we’ll play worse and win, today we did. Poor old Frome, when you’re down the bottom nothing goes your way. It was time to make our way home and by 6:30pm we arrived at The Swan in Faringdon. 4 ales available, with sadly, just one of their own available, Faringdon’s Folly Ale 4% chestnut ale with very little going for it. The other ales on tap were Cheddar Gorge, Youngs Bitter and St Austell Trelawny, all a bit disappointing. 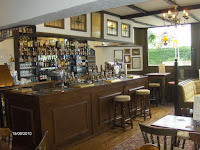 Nice enough pub, pleasant décor, would have improved ten-fold had they had a better selection of their own ales on tap. We had just the one beer and decided to go home. However, as we approached the outskirts of Towcester we all became consciously aware of the ‘Borg Hive Collective’ “resistance is futile, prepare to be inebriated” so we went to the Towcester Mill brewery tap. Always a good place to sample some very decent ale, we only had the one. Citra and Bogsnorkle went for Mill Race, Parker the Bell Ringer and I went for a Castle Brewery’s White Knight, a new one for me so had to have it. The Mill Race and Bell Ringer ales were consumed during our 'Poole day out' blog so tasting notes can be found there. The White Knight at 4.1% was a nice golden ale, typical American pale ale. As expected all the ales in tip top condition. I believe one or two other Poppies supporters frequented the Mill on their way home, perhaps we should ask for commission. Marshall, Petit Chemise and Wort, frequented a few different pubs on their day out, their blog will be posted in due course. Update from the Pharp chronicles. Pharp is away fishing in the Shetlands with his anosmatic chums. Apparently as the Aberdeen to Shetland Islands ferry pulled out of the harbour, the ship’s horn blasted away, the following flock of seagulls plunged into the sea and never took off again. Ship’s horn, It may have been Pharp? The Captain announced over the ships tannoy system. “The journey should be a good one, we are expecting a fair wind and we should arrive at our destination by sunrise tomorrow morning”. Clearly he didn’t realise Pharp was on board, you can imagine his astonishment when they shot passed the Orkneys and arrived in the Shetlands just before sunset the same day. Tops marks must go to Reckitt Benckiser for seizing upon a marvellous marketing opportunity. They have managed to persuade the islanders to change the name of their main town to Airwick for the duration of Pharp’s holiday. On the second day Pharp went deep sea diving wearing a skin hugging wet suit. Unfortunately, after an hour, Pharp floated back to the surface. No amount of lead weights was going to keep him underwater. Nobody volunteered to help Pharp remove his now enormously inflated wet suit. Fortunately the local javelin champion could throw at least 100 metres, which was just outside the safety perimeter cordon. As the javelin pierced the wetsuit Pharp took off, before you could say Scarlett O’Hara, whoosh! Pharp had gone with the wind. After several loop the loops, double back-flips and crashing through a flock of startled guillemots, Pharp splashed into the sea and shot across the surface, torpedo-like, at a considerable rate of knots. Pharp was later seen on a beach in Norway, where Greenpeace were trying to drag him back into the sea. News courtesy of the Bugle. We tried the Cross Keys at Rode, just the other side of Bradford on Avon. They served a most refreshing pint of Butcombe Yeti. Light colour and smooth tasting with a satisfying citrus finish and a loose head which struggled to cling to life let alone the glass. (Please note that this could have been as a result of the faggots consumed).